Freeport visitors now have the chance to experience a world-class Freeport fishing trip with the island’s most talented and experienced team of Bahamas fishing captains. Folley & Sons has the best reputation anywhere in Grand Bahama Island for providing guests and locals alike with only the most successful and professional of charters. Now, with the team’s 24-foot Pathfinder, guests will get to head out to the coral reefs of the Bahamas to experience a one of a kind Bahamas reef fishing experience. 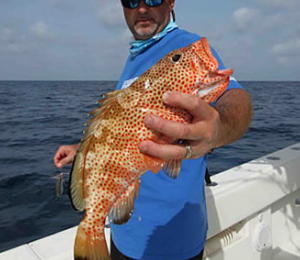 Captain Folley and the team have decades upon decades of experience fishing in the Bahamas. So you can be sure that when you are riding out to sea with these captains, you will be in the hands of someone who is extremely familiar with and knowledgeable of these waters. Reef fishing in the Bahamas used light tackle techniques to catch a wide range of fish that are typically found in the coral reef, including grouper and jacks, just to name two of the dozens of game species that you can catch on your trip. Many of these fish are the type of fish that you can keep and cook later on! In fact, many of the restaurants around our dock will happily cook up your fresh catch for you! There is no fishing charter like a Bahamas fishing charter, and when you book with us, you can rest assured that you will be put in the hands of someone who is not only professional but also very passionate about fishing on these waters. Our team is made up of a carefully selected group of native anglers who have made fishing their life-long passion and career. These guys love to meet visitors who are as curious or passionate about fishing as they are. Whether you are brand new to fishing or are an experienced angler yourself, our guides are ready to show you the perfect Bahamas fishing charter out to the reefs! I have been to the Bahamas many times, but Folley & Sons Freeport Reef Fishing is one of my favorite trips! It includes everything that everyone should do here. As a Bahamas veteran, I can say only the best about this experience!